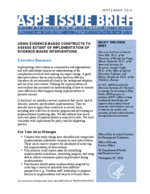 This brief is one in a series exploring issues related to the implementation of evidence-based interventions. It describes several constructs that can be used to describe, monitor, and facilitate implementation. It also describes how to apply these constructs in several ways, including data collection to monitor progress and developing an implementation monitoring plan. The brief explores how much time each phase of implementation is expected to take, and concludes with implications for policy and for supporting practice. This brief is one of three developed as part of the Investing in What Works project, which builds the knowledge and supports that evidence-based programs can use to improve the quality and outcomes of interventions funded through federal investments.